"All your seriousness is about sandcastles. And you yourself will leave them one day, trampling them down, and you will not look back. The people who take it seriously miss the beauty of playfulness." 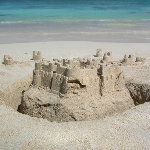 There is nothing more rewarding than seeing a sandcastle go up; being able to stand back and see your masterpiece. Though as much "work" that goes into it, easily enough, we walk away from it, watching the waves roll over it, or see people walking across it. Not once do you consider taking it with you because you know it serves its purpose at the beach. 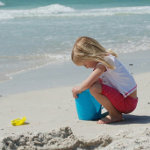 Allow yourself to continue being childlike in your sandcastle building. Enjoy the shoveling and take in the energy of the sun. Put down the picture of your your ideal sandcastle, and just enjoy the moment. The sandcastle you build today is more complex than the 6 inch castle from yesterday but the one today may be smaller than the one that will stand tomorrow. In the meantime just be playful. If it gets knocked over, laugh. A sandcastle only stands so long so don't take it so seriously. Be youthful and have fun.